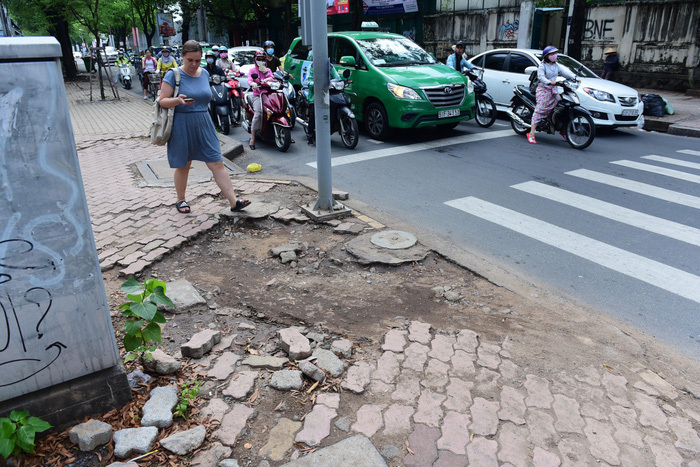 A number of pavements in Ho Chi Minh City have long been ruined as motorbike drivers frequently mount the sidewalks, running over what has been regarded as poorly constructed and maintained walkways. Multiple sidewalk portions have been seriously damaged along main roads running through the metropolis’ central and suburban districts, and even recently completed multimillion-dollar boulevards. The pavement of Dinh Tien Hoang Street, connecting District 1 and Binh Thanh District, for instance, is suffering loss or dislodgement of tiles at several locations, with hollows formed in the bare ground. The damage is more extensive along the nearby Nguyen Thi Minh Khai Street, whose curb a large number of motorcycles would mount during rush-hour congestion, a frequent occurrence in the city. Near the intersection of Nguyen Van Troi and Tran Huy Lieu Streets in Phu Nhuan District, two sidewalk spots, where granite tiles were broken into pieces, are separated a few meters apart, while puddles appear at manholes around which shattered tiles can be seen. The ruin is most visible at the sidewalks right in front of local houses, business offices and buildings, some of which are uneven and distorted. The situation is chiefly caused by lack of awareness from motorbike riders and low-quality cursory paving which leads to tiles disengaging from their positions, said Nguyen Thi Thuy Linh, a downtown dweller. Riding a motorbike or car on Vietnamese sidewalks, which is subject to fines of VND300,000-400,000 (US$13-18), is a common sign in the southern metropolis. Leaders of the areas with affected sidewalks told Tuoi Tre (Youth) newspaper that they had received reports from residents about the damage. Nguyen Ngoc Tuong, deputy director of the municipal traffic safety service, admitted that a number of districts in Ho Chi Minh City are facing sidewalk dilapidation, proposing that measures should be taken of requiring those bodies responsible for sidewalks to do repair work. A representative from the city’s Department of Transport said local administrators have been tasked with the walkways’ construction and repair, and the structures broke just a few months after maintenance due to motorcycles. But the administrators are negligent, said Ngo Hai Duong, an official at the department, which calls for a more aggressive handling of the above insufficient care and management.